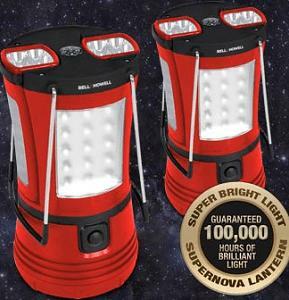 Owning a Supernova lantern is just like having the power to turn night into day. With 70 LEDs, it can light up a room with high intensity brightness, at a full 360°. It is packed with amazing features that are designed with your convenience in mind. It is easy to use and portable enough to be brought anywhere. It comes with fold away handles allowing you to hold or hang it without fuss. You will also admire it’s versatility. With two easily detachable torches, Supernova can conveniently function as a flashlight or a torch, in a flash. All it takes is a simple push of a button. You will never be powerless in the dark again. Whether you need light for unlit basements, dark closets or power outages, Supernova will brighten your way. Make sure that you have one in your car for roadside emergencies, especially when you need to do some fixing. If you need a flashlight to take with you when you’re walking the dog or to do some reading in the dark, grab a torch and you will have all the light you need. Supernova is also great for camping. It will light the tent, walkway, and table all at the same time. It is ideal for use outdoors, since its sturdy construction makes it impact and water resistant. It can also last for thirty long hours without needing a battery change. It even comes with a compass to make sure that if you get lost, you will find your way home. The cost of Supernova is $29.95 plus $6.95 shipping. The special TV offer allows you to receive a second Supernova by paying the extra shipping fee of $6.95 for a total price of $43.85. Works for 30 hours without changing batteries. Supernova is made up of 70 powerful LEDs that allows it to give off high intensity brightness, that can light up a room a full 360°. Push the switch button to turn the lantern on. 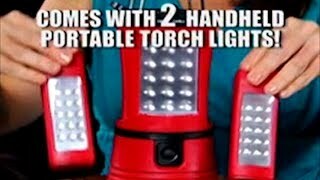 To use as a flashlight or torch light, simply detach the torches from the lantern. Switch the button ones to use as a flashlight, and twice to use as a torch light. 30-Day Money Back Guarantee (Less P&H). For customer service, please call 1-877-491-1011 between the hours of 8:00AM - 8:00PM EST. The quickest and easiest way to contact us 24 hours a day is by going to www.customerstatus.com. Please allow 24-48 hours from placing your order until it’s updated in our system. How can I avail of the special offer?